In this BMW you don’t step in, put your car in ‘D’ and drive off, like you would do in a Tesla. You need to perform some additional actions. You get in, you push a button with ‘Start’, you put your car in ‘D’. 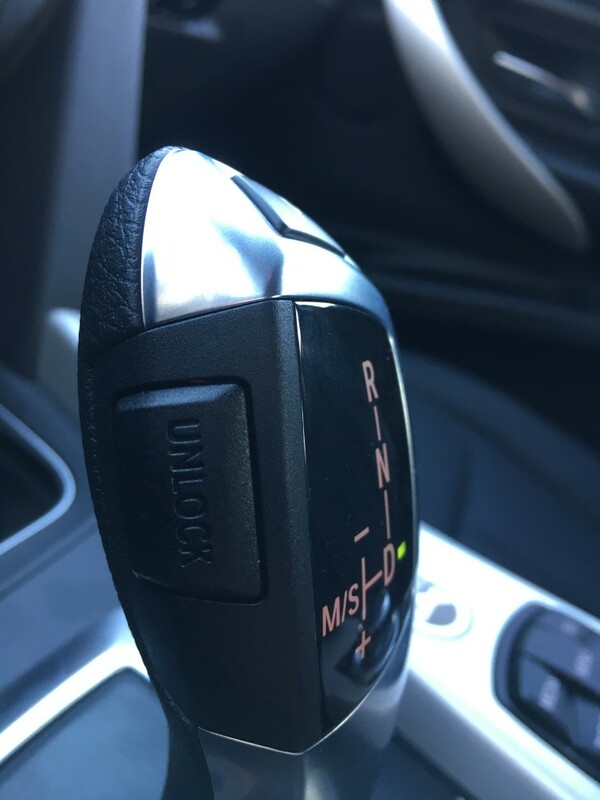 While doing, don’t forget to push the ‘unlock’ button on the gear lever. Don’t forget your parking brake, and then drive off. The main thing I missed is the instant response of my ‘Watt’-Pedal. This ICE needs to rev a bit before it has its power. Which sometimes takes up to a second. This one even had ‘Efficient Dynamics’. It turns of its engine at stoplights (a feature you can disable) which results in even slower response times on the throttle. Also power steering is disabled when the engine stalls, an annoying side effect. And off course I missed the incredible silence when accelerating. Although the automatic gearbox made it possible to keep driving in the low revs, and using the torque of the engine. But on kick-down, a lot of noise erupted from the engine bay. I had the impression that although the BMW was equipped with ‘Connected Drive’ (The online connectivity of BMW), it didn’t have the quality of traffic info that I have in Model S. I was routed through villages to avoid traffic, but the traffic in the villages was not displayed in the navigation. Plugging in at home every night is also one of the things I missed. After one week I had to get to gas station to fill the Beemer up again. Wasted time, being outside in the cold. I’d rather be inside while my car absorbs energy. The seats. I have the old seats in my Model S (not the next-gen seats), but the ones in this 3-series were a lot better. I felt more comfortable sitting in them, with much better side support. The airco, or in these winter days heather seems to work better. Or the heath stays better in the car. But that was one of the things why my Tesla was in the Service Center. I hope it’ll be better when I get him back. I had some fun times with this BMW. Although my Model S has more power, I didn’t feel underpowered in the BMW. And the fact you can’t jump in, put in the gear and drive off is minus for the BMW. I’ll be happy to be rejoined with my Tesla Model S.